Matt Tomerlin’s pirate novels immerse readers in a violent Golden Age of Piracy where fictional characters meet legendary pirates such as “Calico Jack” Rackham, Benjamin Hornigold, Charles Vane, and the infamous Edward “Blackbeard” Teach. The adventure begins when Captain Jonathan Griffith kidnaps Katherine Lindsay, who will one day become the ruthless Kate Warlowe, captain of the Scarlet Devil and bane of the Caribbean. 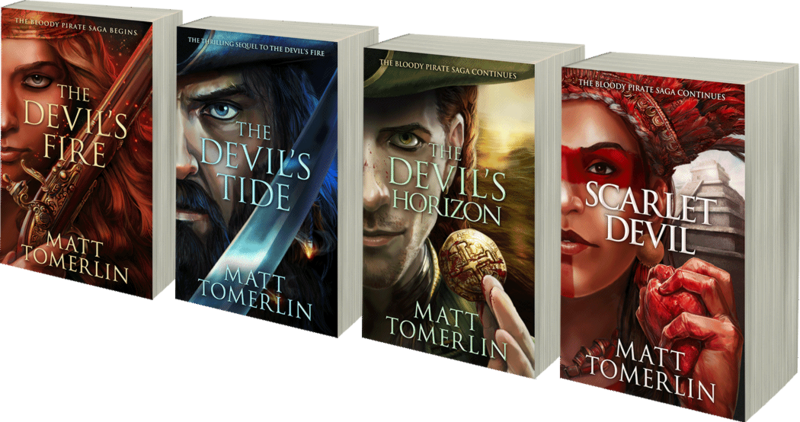 Tomerlin takes readers through the minds of several pirate characters, alternating between POV chapters, from the virtuous to the truly evil. Pirate lovers will find no shortage of treachery, cutlass duels, ship-to-ship battles, buried treasure and much, much more. Katherine Lindsay, the pampered young wife of a wealthy ship captain, has left her leisurely life in London to accompany her husband to America. So far their journey has been uneventful, even boring. 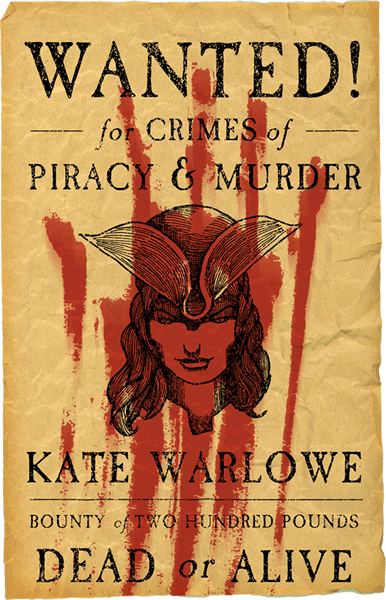 But when pirates suddenly storm the ship to plunder her husband’s riches, Katherine is one of the treasures they steal, sparking a bloody chain of events that will alter the course of piracy in the Caribbean forever. 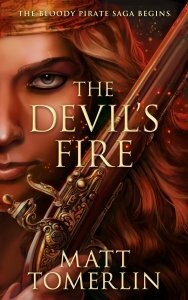 Hostage-turned-pirate Kate Lindsay returns in this action-packed followup to The Devil’s Fire, and the last thing she wants is to go back to her mundane life in London. 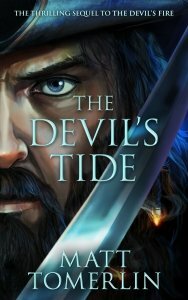 A young pirate narrowly avoids the gallows when the governor of the Bahamas enlists his aid in bringing Lindsay to justice. 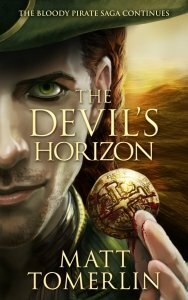 A pirate hunter returns to his old ways, with the demons of his past swiftly following his trail. A beautiful strumpet falls in league with Blackbeard, witnessing his despicable crimes firsthand, before she becomes a pawn in his schemes. As all sides spiral toward a fiery climax, nothing is what it seems, and the odds are in favor of death. “Pirate novels are too often accompanied by a goofy hero/heroine who outruns grotesque zombies, translucent ghosts, singing mermaids, and/or monstrous krakens. I wanted to write a story that took pirates seriously and portrayed them as realistically as possible, while still spinning an entertaining yarn. I spent the better portion of a year studying piracy, ships, and the era in which the story would take place. I needed this world to feel as authentic as possible, so its outlandish events would be easier to swallow. These pirates are not caricatures. They are sailors who rebelled against ruthless captains, young men who rebelled against strict fathers, and slaves who seized their one chance for freedom. 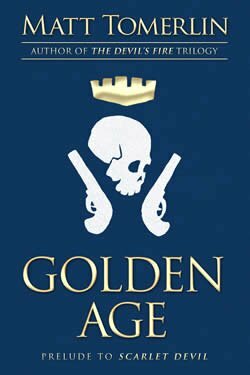 Read Matt Tomerlin’s short story, GOLDEN AGE, which takes place during THE DEVIL’S FIRE and foreshadows the events of the fourth book, SCARLET DEVIL. Governor Woodes Rogers arrives in Nassau, determined to rid the Caribbean of its pirate populace. Jack Rackham, Anne Bonny, and Charles Vane have other plans. © Copyright - The Devil's Fire Trilogy / Scarlet Devil - Matt Tomerlin . Jolly rogers and WANTED! poster by Brendon Mroz. 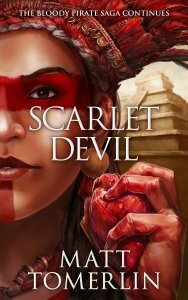 Scarlet Devil and Silver Seas cover art by Nicole Cardiff. TheDevilsFire.com is a participant in the Amazon Services LLC Associates Program, an affiliate advertising program designed to provide a means for this site to earn fees by linking to Amazon.com and affiliated sites.